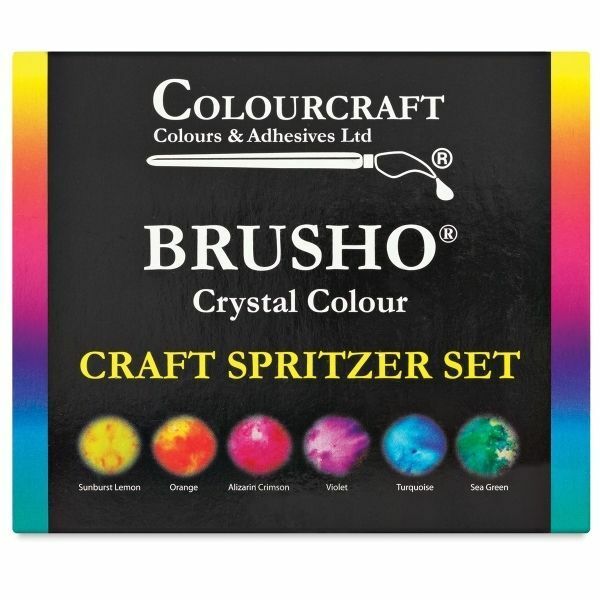 Ideal for card making and other crafts, this set includes six 15 gram pots Brusho Crystals (Sunburst Lemon, Orange, Alizarin Crimson, Violet, Turquoise, and Sea Green), plus a spritzer bottle for creating bursts of vibrant background colour. 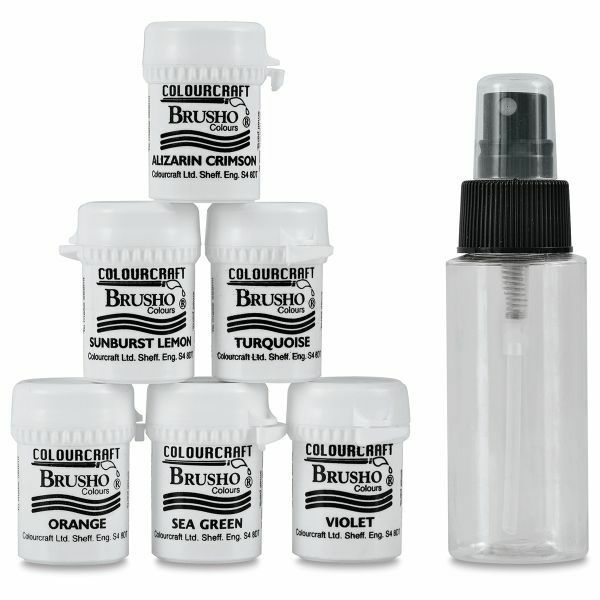 Brusho is a unique, transparent, extremely high quality water-colour powder. Totally intermixable, can be used for everything from painting scrap box models and simple sprinkle techniques, to water colour design work and wood staining Outstanding effects can be achieved when Brusho is used for design work and decorative effects on fabric Suitable for use in schools at all levels and by all age groups. Discover the magic of painting with Brusho. Brusho allows you to create visually stunning, expressive artwork with the minimum of fuss. It's fun to use, beginner-friendly and ideal if you want to learn how to create very contemporary, very striking images. Because it's so loose and expressive, it's much easier and faster to learn than traditional watercolour. You have no choice but to let the paint do the work and with Joanne's technique of using Brusho there aren't really any errors to be made! Joanne will show how to use it to create stunning watercolour paintings. Many of her techniques can also be used on other surfaces. 3 hours of stunning ideas including Brusho qualities and characteristics, mark making, bleaching and working with wax.